This past weekend the Minor Bantam Kings captured Silver in Newmarket, The International Silver Stick that is. This prestigious tournament brings champions together that have won qualifying tournaments in their respective Regions across North America to compete over a four day tournament for the beloved 'Silverstick'. Although many teams have qualified from Grimsby Minor Hockey Association (GMHA) in the past, this is the first time in GMHA history that a team has won an International Silverstick competition. 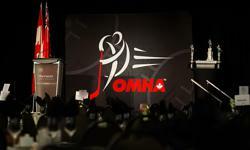 Congratulations to the players, coaches, families and GMHA for this great accomplishment.